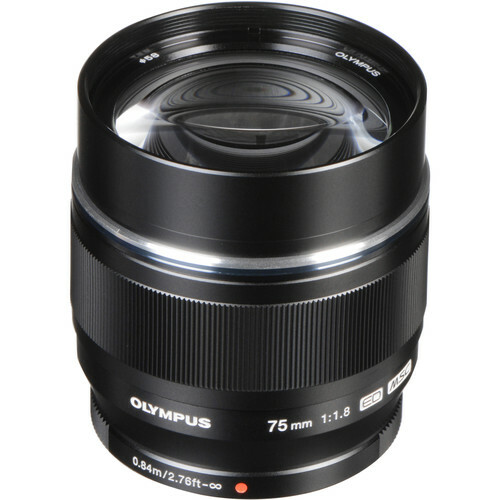 Characterized by its telephoto design and bright maximum aperture, the black M.Zuiko Digital ED 75mm f/1.8 from Olympus is a 150mm equivalent prime for Micro Four Thirds mirrorless cameras. Coupled with the reach and visual compression of the focal length, the bright f/1.8 maximum aperture enables extensive control over depth of field to make this lens ideal for portraiture applications. Its optical design incorporates three extra-low dispersion elements and two high refractive index elements to reduce a variety of aberrations and color fringing for sharp, clear, and color accurate imagery. A ZERO coating has also been applied to individual elements to suppress surface reflections and flare for greater contrast and color fidelity in a variety of lighting conditions. Additionally, a Movie & Still Compatible (MSC) autofocus system is employed to deliver quick, quiet, and precise focusing performance to suit both video and photo applications. Mid-length telephoto prime is designed for Micro Four Thirds mirrorless cameras and provides a 150mm equivalent focal length. Fast f/1.8 maximum aperture helps to achieve shallow depth of field and selective focusing effects, and also benefits working in difficult lighting conditions. Three extra-low dispersion elements help control chromatic aberrations and color fringing in order to achieve a high degree of clarity and color accuracy. Two high refractive index elements are also featured, and help to suppress spherical aberrations and distortion for improved sharpness and resolution. A ZERO (Zuiko Extra-low Reflection Optical) coating has been applied to individual elements to minimize lens flare and ghosting for improved contrast and color fidelity when working in strong lighting conditions. Movie & Still Compatible (MSC) autofocus system benefits both photo and video applications due to its smooth, quiet, and fast performance. Box Dimensions (LxWxH) 6.0 x 3.8 x 3.8"
M.Zuiko Digital ED 75mm f/1.8 Lens (Black) is rated 4.8 out of 5 by 125. Rated 5 out of 5 by FrankyB from The sharpest lens I have owned. This is a fantastic lens. I think it is the sharpest lens I have ever owned in over 50 years of photography. I use it on an OM-D E-M5 and I am able to crop to an amazing extent and still get sharp images. Color and contrast are excellent. For a 150mm equivalent f/1.8 lens it is compact and light. My lens has a little flaw I can see when I look through the objective lens (a point of light). I considered returning it, but as I tested it I could not find any trace of it in the images and it is so darn good, that I decided to keep it and not risk exchanging it and getting an inferior copy. That is how good the image quality is! Rated 5 out of 5 by Ribshots from Best lens I own I've never had a prime lens that factors out to 150mm. Frankly, its a little too close for me and I need to get used to it, which I am starting to do. I have to say that this lens creates the most amazing images. sharp focus, beautiful bokeh when you shoot wide open. There's a warmth and quality to the images produced by such a great quality lens that I wish i could afford an entire arsenal of these types.I'm looking forward to shooting some rockshows (concerts) with it as I love the low light performance. I've shot as the still photog on a video set and used it almost exclusively with great results.If you have the means, I highly recommend it. Rated 5 out of 5 by Knoxman from Insanely good This is a superb optic for the M4/3 format -- the best lens available, easily... I have the 12/2 (which is excellent in its own right) but this raises the bar so much higher. Ridiculously sharp. I was on the fence about dropping the cash for this (considering it's about the cost of the OM-D itself), but after my first day shooting with it, it was a no-brainer... 150mm-equiv. is a tough focal length for me (I'm more of a 24-50mm shooter), but when you need the reach, nothing delivers quite like this (well, the Leica 75/1.4 had extra special bokeh, but that's another story altogether). If you need the reach and M4/3 is your system, look no further. Rated 5 out of 5 by George from Great Lens I have a bunch of micro-4/3 lenses and this is the best one that I have, so far. I would have purchased it long ago had Olympus brought out a black version at introduction. When I bought this lens it was difficult to source the matching lens hood (not included with the lens) - it wasn't in stock at B&H. Regardless, the images are crystal-clear, even wide-open. I have taken multi-shot (stitched mosaic) portraits with this lens , and dare I say it can beat single shot images from my digital Hasselblad and 8x10-inch camera. Highly recommended! Oh, and the black lens hood, although over priced, is probably the best lens hood I've owned, including Leica M lens hoods - recommended. Rated 5 out of 5 by rxfactor from Love the build quality!! First off I have read a lot about how people complained about the size of this lens compared to other m4/3rd lens. Yes it is larger than other prime lens in the olympus line up, but for it being 75mm (150mm full frame) it is tiny. It is close in size to any canon or nikon 50mm 1.8 lens. Which those are tiny for those companies line up. I think it is a perfect match for the em1 body. Love the metal construction. This lens is a beast when it comes to sharpness. It is true from what all of the other comments say around the internet that you probably have read. This is a must own lens. Rated 5 out of 5 by Tom from Expensive but Leica quality I am a photojournalist and in over 30 years I have owned a lot of lenses and brands, like Hasselblads, Nikons and Leicas, but this lens along with the EM5 is amazing. Cannot be any better at f1.8 period, I thought the 45 1.8 was awesome and this is better. I have been using it for some news shots, some hockey games and candid portraits, mostly wide open with great results. I will never sell this lens. I do use either a handle or an old Nikon motordrive to add some weight to the body until I break down and buy the Oly battery grip, but even without a grip the IBIS works miracles. In the past you could not afford or find a 150mm f1.8 and when you think about that it really is worth the asking price. Also 150mm is really close to a 200mm in real world shooting so it can replace a big zoom for a lot of jobs which is what I am doing. Rated 5 out of 5 by Curley from Fantastic lens -- What more can I say? This lens has been universally praised, and rightfully so. It may be the sharpest lens on the planet, and the build quality is superb (not to mention the fact that it's absolutely gorgeous). While not as versatile as a zoom, it produces better image quality than any zoom, and you can use your feet and judicious cropping to increase its effective range. It's great for photographing people because you don't have to get uncomfortably close, and with the f/1.8 max aperture, you can achieve great subject isolation. Yes, it's expensive, but once you hold it in your hand and see what it can do, you'll understand why. Rated 5 out of 5 by Gregg from Fantastic Lens if you appreciate primes Before buying, I agonized a lot between the reported sharpness of this lens v the convenience of the Panasonic 35-100 so I took test shots with both lenses , along with my Olympus 40-150 using my Olympus OMD in low store lighting. When I loaded the shots on my computer, the difference was night and day. The 40-150 repeatedly missed focus in the dim light. The 35-100 was in focus, but the crispness, detail and color fell way short of what I got from the Olympus 75mm. So I thought about the fact that I seldom take shots that demand swift changes in focal length. I already have the Olympus 45mm f1.8 so with the 75mm I now have short and mid-range telephotos that produce fantastic image quality. What I lose in convenience, I more than make up for with lens speed and picture quality, at a lower weight and cost. I will take that deal any time. Would this lens work well on a Black Magic Micro Studio camera for filming indoors in low light? Being that the Blackmagic Design Micro Studio Camera 4K has a Micro 4/3 lens mount, this Olympus M. Zuiko Digital ED 75mm f/1.8 lens can work on it. Will it work on a Panasonic GX7? From what I can tell the GX7 uses micro four thirds lenses. Both Panasonic and Olympus do very well at sticking to the micro four thirds standard, meaning you can use either brand lens or either brand body. So yes, if the GX7 is a micro four thirds body, the Olympus 75mm will work quite nicely. As a reference I have an Olympus body and I use both Olympus and Panasonic lenses. Also this 75mm f/1.8 is of excellent build quality. You won't be disappointed. Is this lens good for head-only shots without cropping? As an 150mm full frame equlent, yes it is. Is the lens able to focus when in Continuous AF mode? Say for sports or moving subjects? Lens will focus super fast if Your camera has a fast focus. Slow focus on camera will cause missing shoots.EPL, EPM series are not that fast. I am going to say Olympus OMD: top of the line , Panasonic GH4, GX8 are fast focusing cameras. Is this lens metal or plastic?